Compiled on Karthigai Deepam day – 2014. 1. Although (Siva) is motionless he dances before the Mother (Sakti) who stands still in the court (of Chidambaram). 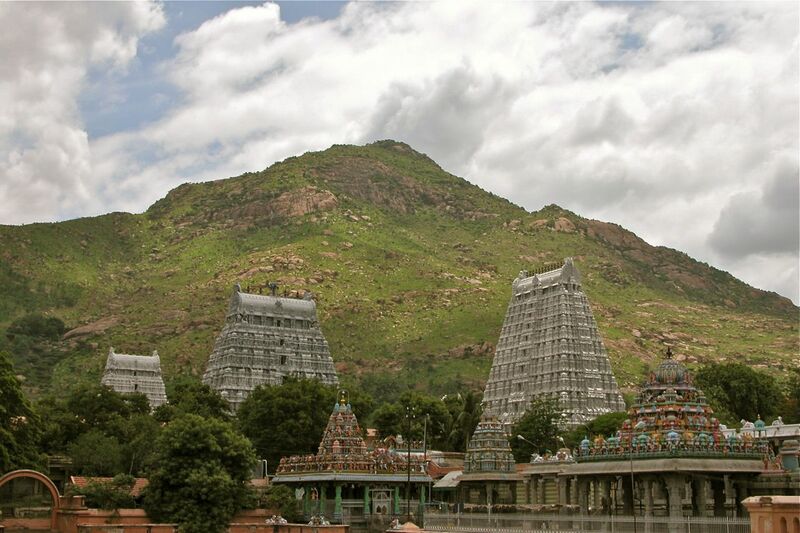 But know that that Sakti is withdrawn into His unmoving Self and He stands in His grandeur as the towering Arunachala. 2. When one enquires into the meaning of Arunachala, which is lustrous like red gold and bestows Liberation, one finds that the word ‘Aruna’ means Sat, Chit and Ananda, the identity of the Atman and Brahman and that the word ‘Achala’ means perfection (complete). 4. Annamalai  ! Delight of my Eyes! Lord who art Consciousness Itself, beyond differences of male, female and neuter! Do not think of letting me pine away in despair as one unmindful of Thee (for Thou art ever in my mind  . Is it not unbecoming Thy Grace that I should be reduced to dust mistaking the vile body for the Self? Do not therefore deceive me in any manner but turn Thy full and refreshing glance upon me. Abide in my heart. 5. Lord! Who art Consciousness Itself, reigning over the famous Sonagiri  . forgive all the grievous faults of this poor self and by Thy merciful glance, benignant as the rain cloud, save me from being lost once more in the dreary waste, or else I cannot cross the terrible ocean of births and deaths. What can match a mother’s care for her child? Deal with me (like a mother). 6. ‘Killer of Kama’  Thou art always called by Thy votaries. Yes, that is true. But, Lord of Arunachala, I doubt whether this (name) fits Thee. If it is fitting, how can the Invisible One (Kama), the mighty, dare, brave and valiant though he be, to creep into a mind sheltering under Thy Feet Who art his killer? 7. Annamalai! As soon as Thou didst claim me, my body and myself were Thine. Can I then lack anything? (What else can I desire?). I can think only of Thee (hereafter), not of merit and demerit, O my Life. Do as Thou wilt, then, my Beloved, but grant me only ever increasing love for Thy (dear) Feet! 8. I was born at holy Tiruchuzhi, the seat of Bhoominatheswara, renowned in the world, to the virtuous Sundara and his faithful wife Sundari. In order that Siva, the Absolute Consciousness, might shine forth and the Self flourish and that I might be rescued from the misery of the world and the snares of the despicable senses, the Lord of the Red Hill (Arunachala) raised me to His state. 9. Bearing and tending me in the world in the shape of my father and mother Thou didst enter my heart and before I fell into the deep sea called Mahamaya  and was drowned, Thou didst draw me to Thee and keep me at They Feet. How shall I describe Thy wonderful Grace, O Arunachala who art Consciousness Itself?